Do your children have a favorite bedtime story? I can think of a few that are up there on the list. But at the very top, high above everything else, the undisputed favorite bedtime story in our home is ‘Goodnight Moon’ by Margaret Wise Brown. All four of my daughters have fallen in love this book and requested to have it read over and over and over. Somehow it is the only book that after 11 years of reading it to her sisters, I still pull from the shelf and read to my littlest one. If you are anything like me, you are quoting it to yourself while you read this…. As many of you know, my three year old has some significant language and speech problems. One of the ways that we work on words with her is to repeat stories over and over. We point to the pictures. We randomly flip through the pages and ‘spy’ things. There are three activities in the pack. The first is a set of twelve cards that can be printed on card stock or scrapbook paper, so that they are not see-though. 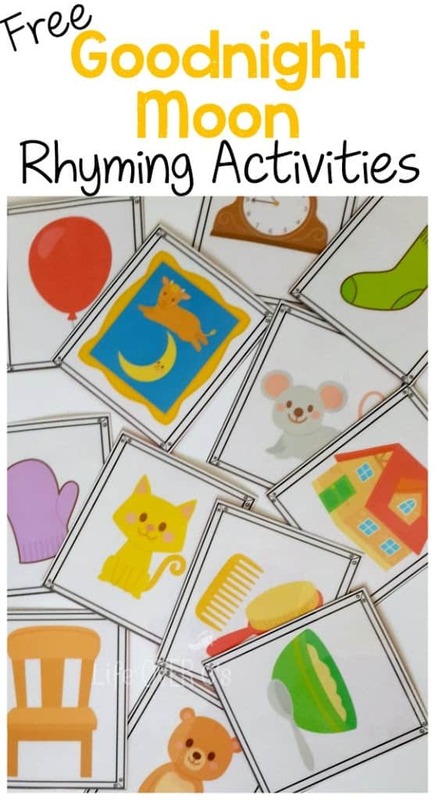 Then they can be used to play memory with rhyming words or just simply to match the cards. Or if you want, you can print two copies of the cards and play memory by matching the pictures. The second activity is an I Spy page. I included pictures of a lot of the popular words in the story. You and your child can use the page to find the different elements as you read through the story. The third activity is a mini-book for rhyming words. 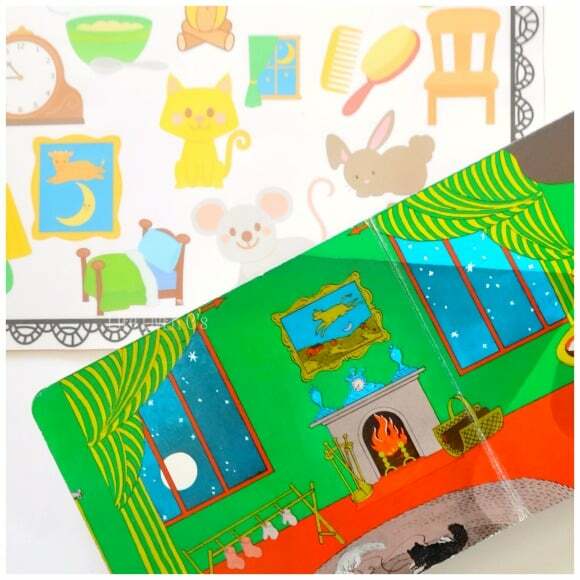 This emergent reader is designed to use repetitive words to build confidence in young readers. 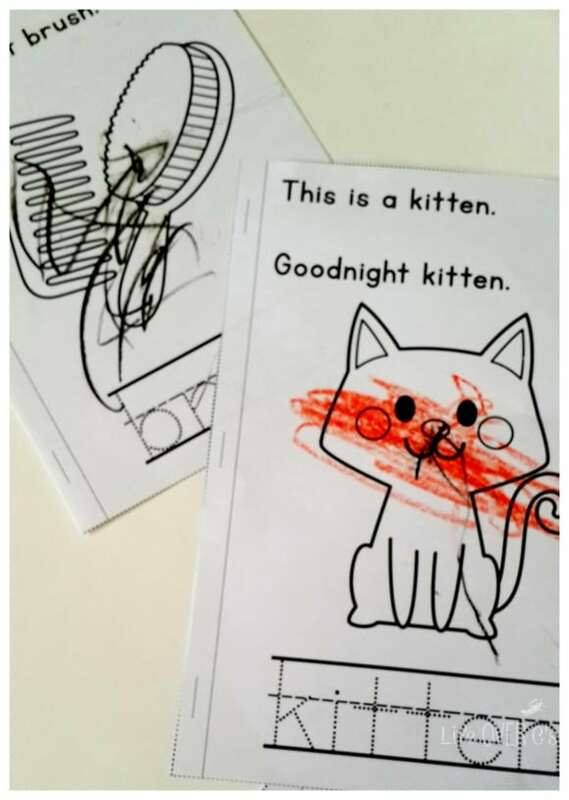 They can also color the pages and practice their handwriting skills. It’s finished off with a rhyming pictures match-up. This was Shiloh’s book. She begged to color one while Jaida was working on her own. Hello! 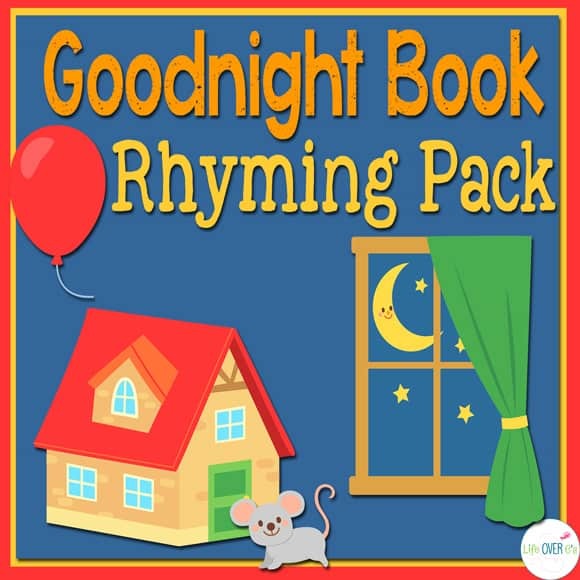 I would love to download the free Goodnight Moon rhyming pack, but it is not showing up. Is it still available? Mandi, I have double-checked and you can access the freebie by clicking on the final Goodnight Moon picture or the hyperlink directly above it. Follow the steps through the store to checkout and you will receive 2 e-mails. One will be the confirmation of the order and the second will have the link to download in it. Many times the second e-mail goes to the spam folder, so if you don’t see it right away, check there. It usually only takes a few minutes to arrive. thanks for your quick response! both links are working when I click them and take me to the store page, however, there is no content on the store page. I have tried from several different computers. it just says “store” and directly underneath is the bottom of your webpage. is there any other way to access it? It must be the loading speed on your computer. Sometimes if I’m on a slow internet connection, I will have that problem, but on a faster internet connection there is no problem. Hi Kim, Thanks so much for the free book activities. we used to read this book all the time and now i can use it as a game. 🙂 I just printed it off and the i spy pictures are very nice. Thanks again!